I first tried face masks about a year ago. Bit late there, I know... My friend had just found some natural face masks on offer so I thought I'd try them out too. I've never really been a pamper session kind of girl but I have no idea why!? My eyes had now been opened - or closed..? to how relaxing a face mask is. I've intended to use face masks once a week since then, although it's ended up more like once a month...however this week, I've face-masked thrice and trust me, my face is thanking me kindly! The main things I look for in a face mask is that it's made from natural (and vegan) ingredients, that it's cooling and that it's got some sort of exfoliating property. So I was V excited when I find out about Ooh-arr! Ooh-arr is an affordable, natural beauty range, designed and manufactured in the UK, offering clay and creamy face masks made from natural ingredients and essential oils in cute, colourful retro-style packaging. With all the clay masks, the instructions on the back say to wash your face with warm water, leave damp and apply the face mask, massaging in. After 15-20minutes, rinse off with warm water, pat dry, then splash your face with cold water to close your pores. The Dead Sea clay mask was the first one I tried. It's strong but gorgeous peppermint smell hit me as soon as I opened the packet. It felt very fresh and cooling on the skin which, like I said, is the main thing I like with a face mask because, it's weird, you never realise how warm your face is - particular around the eyes, until you put a cooling mask on it! It also has dead sea salts to draw out impurities and bamboo powder to exfoliate - but in almost a subtle way - I've tried face masks which have the main purpose of exfoliation and you can tell because it feels like a scrub, whereas this mask exfoliated more gently. My face felt so soft afterwards but mostly, my skin felt relaxed. 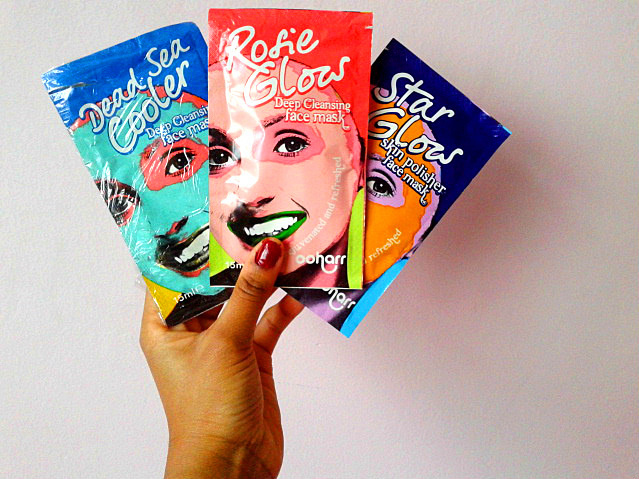 The Rosie Glow clay mask wasn't as cooling as the Dead Sea one and the rose scent was more subtle but still distinct. There were no exfoliating properties and I felt it was more of a moisturising and nourishing type of mask...although it does say it contains dead sea salts and natural clay to draw out impurities. Overall it felt 'subtle' on my skin, the kind of face mask you'd put on for the sake of putting on a face mask while you did the washing up or something, not the kind of face mask you'd put on to relax. The mask came off more easily (maybe because there were no exfoliating properties?) and it left my skin so incredibly smooth! 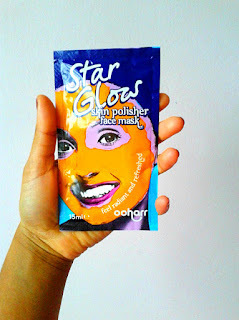 The first thing I noticed when I tried the Star Glow clay mask was the smell, a deliciously sweet, vanilla scent was released as soon as I opened the packet. 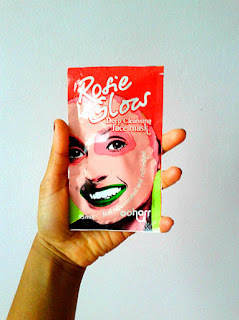 The mask was more cooling than the Rosie Glow mask (but not as much as the Dead Sea one), because of the aloe vera in it. It also contains natural clay to draw out impurities and I could feel soft exfoliation when I applied it. What I loved about it was that the smell didn't relate to the cooling feel. The peppermint smell of the Dead Sea mask is obviously well-associated with cooling and freshness, whereas vanilla is more like baking and cakes and sugar and spice and all things nice. It left my skin looking very hydrated and quite radiant actually! These masks are different to previous clay masks I've tried - they didn't freeze my face so much! Of the three, the Star Glow mask was my favourite because it felt like an all-rounder. It cooled, smelled good enough to eat, exfoliated and straight away left my skin looking and feeling radiant and soft. So I would buy this one again, however, what I didn't realise before was that it contained honey and so, as a vegan I wouldn't feel comfortable using this again. 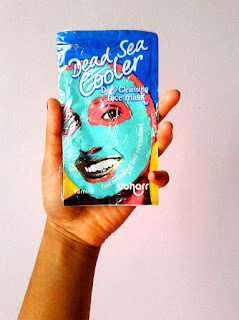 As for the other two, (which are vegan friendly), I'd buy the Dead Sea mask again but for the specific purpose of cooling and relaxing as opposed to a 'general' face mask, if that makes sense? - i.e. I'd use the Dead Sea one on occasion, almost like a treat. But the Rosie Glow didn't make enough of a statement for me to choose it over other natural face masks that also make my skin feel smooth. Overall, I think Ooh-arr's beauty range is quirky, fun and I'm always all over anything that's made from natural ingredients. It's also great that they're quite cheap and at 15ml per packet, they should last a while too! I love the fun packaging! It's been a while since I've put a mask on my face too. ;) Thank you for sharing, dear!